Maile from Boutique Academia has been a sponsor for a long time and a friend even longer. If you haven't visited her shop in a while, she's constantly adding new pieces. And I think my personal favorite is The Southern Cross. What a great way to show your love of faith and science at the same time! All three designs come in either the black onyx or the steel pendant, and as with pretty much all of Maile's pieces, they're versatile enough to be worn with a T-shirt or a classy dress or anything in between. Now here's the best part...Maile is hosting a giveaway. The winner will get their choice of one constellation pendant necklace. There are three easy ways to enter. "Like" Boutique Academia on Facebook and come back here and leave a comment. PLEASE be sure that your Blogger account is linked to your email, so I have a way to contact you OR leave your email in your comment. It's always such a bummer when someone wins who can't be contacted. This giveaway will close at midnight PST on October 20, 2012 is now CLOSED. Maile also as lots of other fun astronomy inspired pieces to check out. Have fun browsing. Thanks so much for entering! And be sure to stop by all next week for more some fun constellation themed and geek inspired projects. Please help me make blankets for kids in my community. 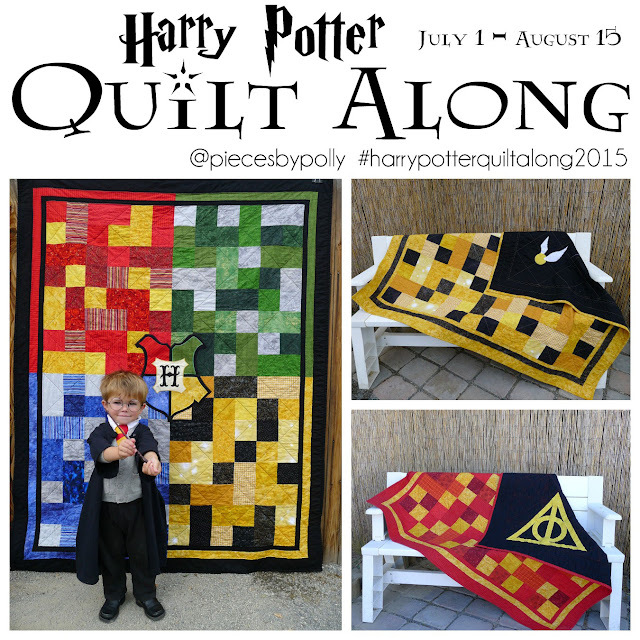 I have mini-quilts available in my shop. All proceeds go to buy materials for local blankets for kids programs. Am already a follower of yours on facebook - what fantastic pendants these are. 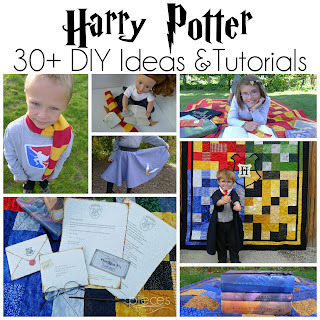 Definitely something for those of us who revel in our geekdom! Wow, have started following her on facebook - my partner is most impressed! Gosh, so many to choose from. My personal favorite has to be the gradient fibonacci. I follow Boutique Academia on Facebook. My favorite piece has been on my to-buy list for a long time. I love the Papyrus Fibonacci necklace. By the way, I'm glad your back, but I'm really glad you spent the summer with your family. New follower of your blog. Love it! Like Boutique Academia on FB. Of the three you first posted I like the Southern Cross in black background but I REALLY like the Sucrose piece and the galaxies pieces. Like you on FB. :) Looking forward to reading more of your blog. I'm a happy follower of your blog. I love the science and math inspired crafts. 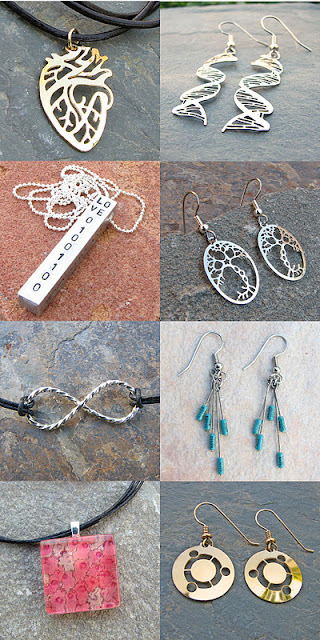 I love the silver Fibonacci necklace. It was hard to choose between that and the constellation ones. LOVE the Pleiades necklace! 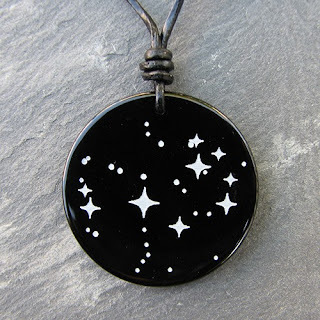 It is so wonderful to see constellations in jewelry! I love the QED necklace! Also, I like Boutique Academia on FB! I liked Boutique Academia on Facebook, too. Thanks for an awesome giveaway! What a fabulous giveaway! I'm already a fan and follower. The Rainbow belt is my new favorite from over there! I think I had a belt almost identical to that as a child! SO GREAT! Already a follower on FB and google. Love your blog! I like the Onyx Big Dipper. Love finding fellow nerds with kids. Happy to have found both of you! And after looking at the shop, I have a hard time deciding on a favorite. But given I am a microbiologist, I am partial to the biohazard necklace.